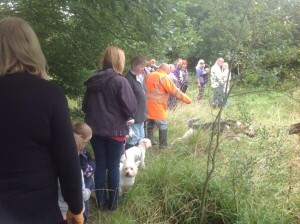 The Summer Woods Walk & BBQ this year was held on Sunday August 3rd. I am happy to report this time the weather was on our side, although we would have loved to have seen a few more residents if only to eat all the delicious food Geoff cooked on his new BBQ (Boys Toys) Well done Geoff and thank you. While Geoff was busy cooking, Jacque and friends made a start on trying to clear away rubbish & glass left behind in the past. It’s a really big job, if there is anyone willing to help us with this huge task in the future, please let Geoff know. We all enjoyed the BBQ food & company, afterwards some of the group went off for a walk, picking blackberries and damson along the way. 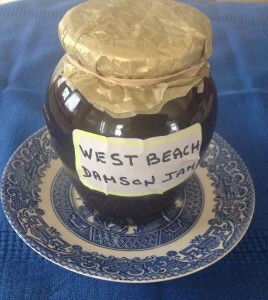 I’m told that lots of jam has been made and consumed since then, unfortunately, I haven’t seen any yet! We were all having such a good time no one thought to take any photos this year. So above photo is from the woods walk last year. It was agreed a good time was had by all and we plan to do it all again next year. West Beach residents, come and join us. Update on jam… Sunday afternoon knock on my door to find a resident holding a jar of damson jam, how good is that.